Updated: 2nd June 2017 - These are the two top competitive research tools currently. SypFu launched a few years before SEMrush and was the top competitor for organic traffic research on till SEMrush showed up. I intend to do a direct comparison between these two to help you decide which one works best for you. 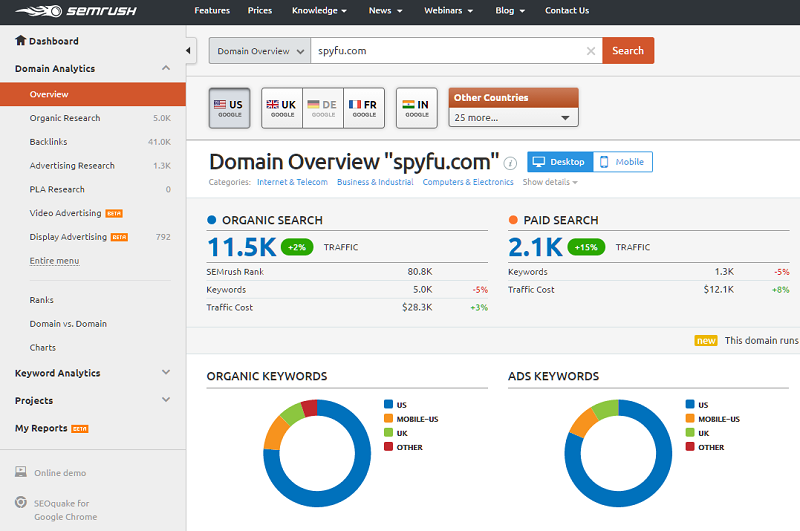 While SEMrush has a much larger feature set now, compared to SpyFu, I will be focusing only on the features that both have in common i.e. Google paid and organic traffic analysis. Developed by same team that created the popular browser addon SEOQuake, SEMrush is a cloud-based SEO tool which boasts of more than 1,000,000 registered users. 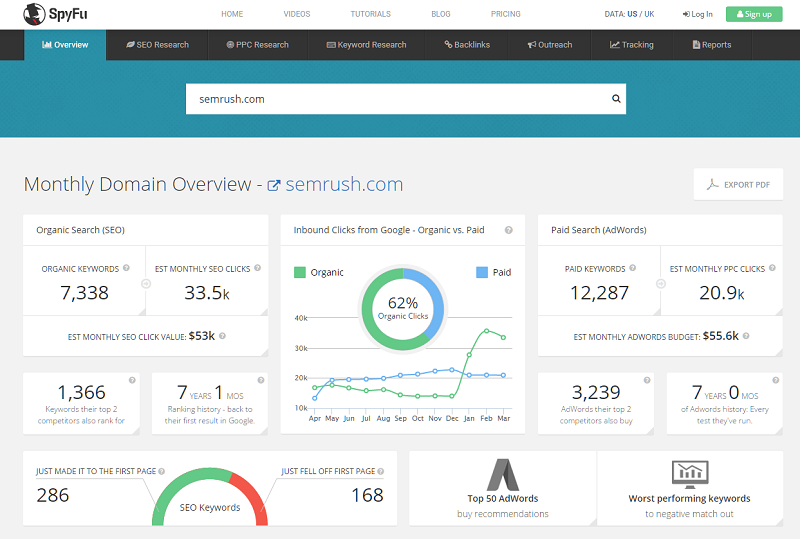 SEMrush gets data every month for 220 million keywords and has more than 120 million domains in its system. In its early days the tool would only show data for organic searches and paid searches (adwords). However recently, they also provide back link data, data on display advertising and PLA research. I have not used the "Projects" feature, where you can track your own keywords. Most of my work is to tracking organic rankings of competitors, to find out what keywords they work for and to figure out strategies to compete with them. SpyFu was launched in 2005 as GoogSpy by Mike Roberts and was the first such competitive intelligence to hit the market. Due to their early launch they have the most historical data compared to any of the other tools. They have been used in the 2008 Obama campaign and have been mentioned often in various online publications. Personally I find SEMrush a lot easier to use. But maybe my judgement is biased as I was first introduced to SEMrush and after that to SpyFu. It's very likely that SpyFu customers from 2005-2010 had a similar bias when SEMrush jumped onto the scene. Long Answer: Although both the tools are awesome, I find the SEMrush data a little more accurate compared to SpyFu and when it comes to competitor analysis, a little more accuracy goes a long long way. Additionally by limiting itself to UK and UK, SpyFu has pretty much abadoned all the other countries, which I'm sure form a pretty significant chunk of the market.